Want to avoid irritation from cheap skin electrodes? 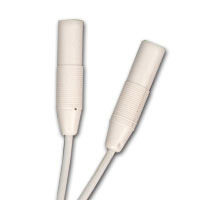 NeuroTrac electrodes are the perfect solution! If you are using cheap skin electrodes; do you find that they often nip you or cause hot spots on to your skin? If so, you need to throw those in the trash – where they belong! Have no fear; you can still use your TENS machine! Swap those cheap, nasty skin electrodes for the perfect, exclusive NeuroTrac Electrodes. NeuroTrac have designed these electrodes with carbon wire; this ensures that the current is delivered appropriately and directly to the muscle. You can simply rejuvenate your electrodes with a little rub of water onto the gel surface; this moistens the pads so you can get only the best from NeuroTrac’s electrodes. Does it get any better than that? Yes it does! These skin electrodes are reusable so you don’t have to worry about purchasing more cheap electrodes that don’t do the job well and in fact do you more harm than good! NeuroTrac’s skin electrodes are compatible with all TENS, STIM, FES and EMG applications.